As a graduate student 35 years ago, Bill Gardner attended his first Transportation Research Board Annual Meeting, and he still remembers the thrill. Gardner and other MnDOT leaders on Tuesday recounted their experiences from this year’s annual meeting — which drew more than 10,000 participants — and encouraged other MnDOT staff to get involved in the organization, which helps set national transportation guidelines, oversees collaborative research and facilitates the exchange of information. “We’re heavily involved, but I think we could be more involved,” said Modal Planning and Program Management Director Tim Henkel, who has been part of the TRB for more than 20 years. Henkel said TRB involvement benefits MnDOT in several ways, including access to national and international experts, the ability to keep tabs on hot-button issues and having a seat at the table in decision-making. “It makes us a more enlightened and informed decision-making body,” Henkel said. MnDOT has more than 60 staff serving on 114 TRB committees and contributes $125,000 annually to the TRB core program, gaining $127 in collaborative research for every $1 it contributes. 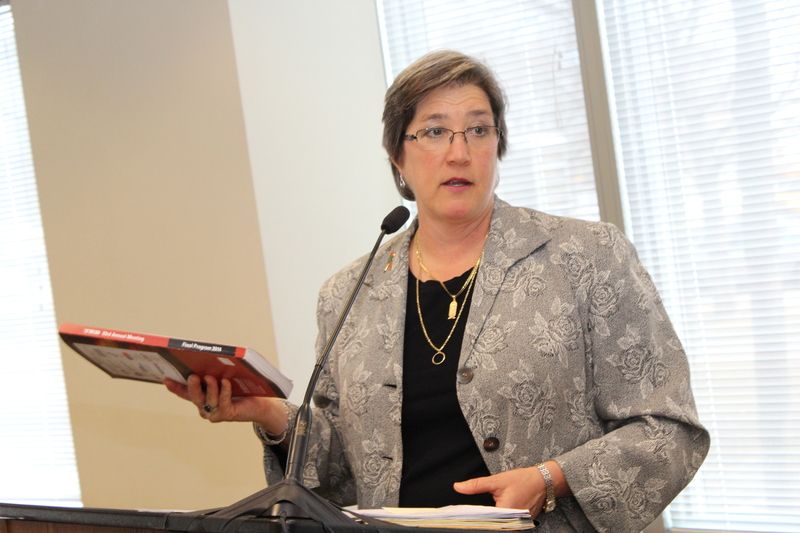 “It’s a very intense and very busy experience,” said MnDOT Deputy Commissioner and Chief Engineer Sue Mulvihill, who displayed the thick program book and other materials from this year’s Transportation Research Board Annual Meeting. State Bridge Engineer Nancy Daubenberger, who serves on a TRB subcommittee and gave a presentation at the recent conference, said it helps to hear about the challenges faced by agencies around the country. Assistant Engineering Services Division Director Amr Jabr, who attended for the first time, said he used a smartphone app just to decide which of the approximately 3,500 sessions he wanted to attend.